Today is my wedding anniversary. Six years. Though my wife and I have been together more than 14, we didn’t get the chance to make our relationship official until Washington State voters legalized gay marriage in 2012. Getting married by a winemaker on a copy of The Wine Bible. The first day that the law took effect was December 9th. But we waited a couple days to have the impossible-to-forget wedding date of 12/12/12. It was short notice going from a whirlwind election night to planning a wedding in a few weeks. Neither of us wanted a huge wedding. We just wanted something simple. We pondered our dilemma on Facebook where one of my good friends, Dave Butner, who founded Kaella Winery, mentioned that he was a certified wedding officiant. At the time, he shared a space with another friend, Scott Greenberg of Convergence Zone Cellars, in the Woodinville Warehouse District. 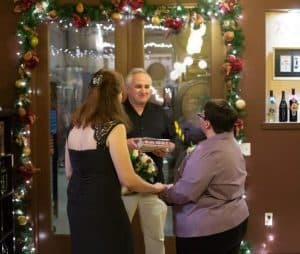 The tasting room was already decorated for the holidays and both Dave and Scott, along with their wives Nancy & Monica, were glad to host a small ceremony. We sent out our invites via Facebook and got catering from a local tapas restaurant. Our wedding wines were bottles from our cellar along with Kaella and Convergence Zone wines. The wedding cake came from Safeway, where I also picked up some Mumm Napa Cuvee ‘M’ sparklers because we wanted something with a touch of sweetness to go with the cake. Then we were married, by a winemaker, with Karen MacNeil’s Wine Bible. So much of my wine journey has been shaped by the love and support of my wife, Beth. It was with her, on a fateful trip to Disney’s Epcot Center, that I was fascinated by the different wines from the various country pavilions. She had been noticing my frustrations working retail management for an office supply store and encouraged me to explore this awakening love of wine. She’ll even drink a “Longneck Moët” for me. 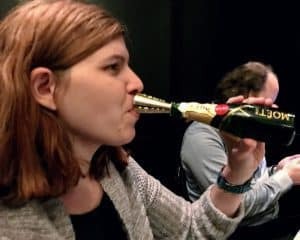 Each step, from signing up for the Certified Specialist in Wine (CSW) to attending winemaking school and pursuing the WSET diploma has been done with her gentle nudging. Even this blog wouldn’t exist without her standing behind me–not only providing the technical support but also keeping me on a writing schedule. She also indulges my follies to explore weird trends like bourbon barrel aged and coffee-infused wines. Even if that means subjecting her to trying these wines as well. You know, for science. But the best parts have been exploring the world with her. This has been an adventure that has included wine regions that I’d only dreamed about visiting before–Bordeaux, Burgundy, Piedmont, Tuscany, Veneto, Santorini and others. While we do enjoy visiting museums and historical sites, she knows my heart gets beckoned by the vineyards. And so she is there with me, in the vines and across the table with a glass in hand. Sharing every bottle, every moment, every step in this crazy journey of life. Tagged Convergence Zone Cellars, Kaella Winery, Karen MacNeil, Mumm Napa, The Wine Bible.